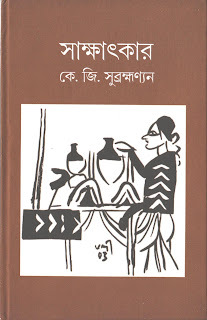 Aitrayee Sarkar reviews an interview-based book of artist K G Subramanyan. A rare insight into the life and works of a living legend. 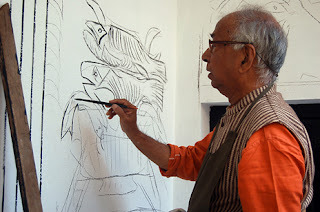 It’s a story of two young editors from Kolkata going to Baroda for interviewing veteran painter K G Subramanyan, popularly called Manida in the art circuit of India. During the conversation Subramanyan gradually unfolds his life before them and shares thoughts that so far are unknown to many of us. Later, the interview was published in a popular Bengali monthly magazine and finally, Kolkata-based publication Debabhasa published a book—Sakkhatkar K G Subramanyan (interview with K G Subramanyan)—in January 2015. The conversation began with the childhood days of the artist. He was born in Palghat, a small town situated at the Tamilnadu-Kerala border, in the pre-Independence era. He, with the family, moved to Mahe which was under the French rule then. That was Subramanyan’s first exposure to diversity of culture at the age of six only. And it was the end. Later, diversity became an integral feature of his life forever after joining the Visva Bharati, Shantiniketan, as a student amid strict monitoring of the great Nandolal Bose and pure affection of Ramkinkar Baij and Benode Behari Mukhopadhyay. In the book Subramanyan has narrated stories of accompanying both Beij and Benode Behari in their routine outdoor sketch ventures. The comparison of the two greats of Shantiniketan also came up naturally. Subramanyan has never seen Tagore in person and he does not regret that at all. Unlike many other old Shantinikatanis, he thinks, that actually gives him the opportunity to conceive Tagore as 'a universal concept' instead of a great personality only. He also speaks about his disappointments of art becoming nothing but a ‘commodity’ although admits to the financial aspect of it too. The book also carries Subramanyan’s experiences with the Gandhian theory and observations on the radical-Leftist movement under the then British Raj. 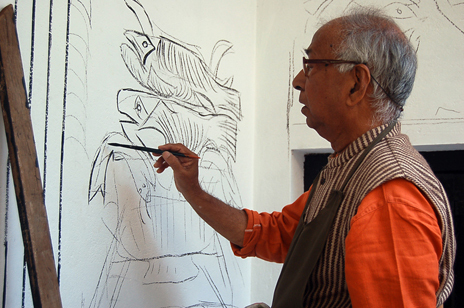 Subramanyan’s works have been largely influenced by the traditional narratives of India like the Puranas, the Mahabharata and dramatic adaptation of parables. He looks to finds out source of experiment in them. His interest in traditional form of art began at very early age when the artist started to accompany his mother to watch stage-theatre. Gradually, he became fond of stage and used to enjoy different traditional forms of South Indian theatre a lot. He loved the vibrant dramatic elements of those plays. Subramanyan strongly believes that images appear before him ‘at a glance’ like a drama. The artist has no option but to wait for that moment of realization, he thinks. The book although based on interview but absence of illustration is a big negative in it. A sketch by Subramanyan used in the cover of the book is obviously a nice gift for the readers. The text is well edited and comprehended. Debabhasa deserves applause for taking such an initiative. Readers would expect similar works from them in future.